Private property is an indispensable component of individual freedom. Without the right to private property, individuals do not enjoy enough freedoms to pursue their personal interests. Private property is a component of individual wealth. Wealth, in any of its many forms, enhances the ability or choice sets of individuals to achieve their goals. The historical evidence is abundantly sufficient to demonstrate to any objective observer that private property rights have been indispensable in the economic growth of the most modern and advanced societies in history. Even China, despite its lack of democracy, offers overwhelming evidence of this condition as it has achieved spectacular and sustained rates of economic growth since lifting restrictions to private property rights and to the accumulation of individual wealth. This is why privatization is especially important in stagnant societies where state-owned enterprises predominate over other forms of property, and propitiate a bloated public sector that reduces the productive potential of the economy and its citizens. For such societies privatization is not simply an ideological objective but a strictly technical necessity for economic growth and alleviation of poverty. The objectives of this research are several. Firstly, to determine how much privatization has taken place in Albania, Estonia and Russia in the last two decades. Then to describe how and explain why the privatization processes vary across those countries in that period. Based on this analysis, we want to examine some alternatives to privatization, such as compensation, when restitution of old properties is not feasible, and briefly evaluate the implications and consequences of various policy options. Lastly, we want to discuss how the experience of these countries can be useful to a similar process in Cuba. We selected these countries because they represent three different dimensions of privatization policies and procedures, offering analytical and comparative opportunities that could be useful for other countries, especially for Cuba when, and if, privatization becomes possible. Privatization can take three main forms. One form is the restitution of property that was once private and was expropriated by a government to become state or so-called socialized property. A second form is the divestiture of state property that was never private, such as assets created by direct government investment. Yet privatization is not limited to transfer of property from the public to the private sector, as it can also take the form of creation, facilitation or development of new private enterprises. It is important to recognize at the outset this third form of privatization because it represents a critical component of a privatization policy menu, by offering flexibility of approaches to policy makers in charge of designing, implementing and managing the process. Though privatization can be seen as a process of restitution of rights that were violated, it is also a policy instrument to energize stagnant economies. In many countries that undertook or were forced to follow the road of communism and central planning, expropriation of assets was not the only form of attacking property rights, but entire sectors of the economy disappeared along with their enterprises. Some notorious examples took place in banking and the rest of the financial intermediation industry, legal and accounting services, commerce, and advertising. But even most of the sectors that survived the expropriation onslaught, the government concentrated them by merging enterprises into conglomerates (empresas consolidadas in the Cuban case) and creating powerful albeit inefficient state monopolies. The need to recreate the sectors that were eliminated plus the need to reinvent their competitive base by dismantling the corresponding state monopolies is the reason why we have chosen to present an ample spectrum of privatization possibilities. In order to properly analyze privatization processes we must visualize the objects of privatization. We identify five main groups of privatization objects. The first group are fixed productive assets such as manufacturing plants, commercial building, energy generators, transmission and communication lines, commercial buildings and equipment, permanent plantations, real estate, rental property, mines, and land. Given the immobility of this type of assets, their identification for privatization purposes tends to be the easiest of all, facilitating privatization by restitution or divestiture. The second group of assets comprises movable productive physical assets such as equipment and vehicles, inventories, and livestock. Due to their mobility, these assets tend to be difficult to identify, locate and evaluate, which makes privatization by restitution to former owners very difficult or even impossible. Their state-owned equivalent, i.e., those that were created by public investment and were never private, could serve as a basis for compensation, but we will discuss this later. A third group of assets are financial in nature and include deposits in bank accounts, cash holdings, insurance policies, retirement pensions not paid by previous governments, and outstanding debt obligations. The fourth group consists of intellectual property rights that include brands, patents, trademarks, and authors’ copyrights for all kinds of registered artistic and intellectual productions. Last but not least, there is a fifth group of assets conformed by personal property such as jewelry, antiques, household furnishings, libraries, collections of various kinds, and paintings. The privatization possibilities of these assets are a direct function of their value as it can be generally posited that the more valuable the asset is, the easier would be its identification and origin. Expensive works of art, for instance, are often identified and located through auctions and other transactions. Privatization of previously expropriated property is generally expected to take place as the restitution of the corresponding assets to their original owners or their legitimate heirs. Nevertheless, restitution is not an option when assets may no longer exist; they cannot be located, as in the case of old inventories or art works; they are not returnable because of profound alterations, mergers or cannibalization; or when claims cannot be supported with appropriate documentation or are not submitted in the period granted to file claims. In these cases, the claims may be for compensation to the owners of the values lost to expropriation, but this presents the authorities with a new set of problems. First of all is the need to determine the total value of the assets that cannot be returned, which would require the assessment of the value of each individual property. Without dwelling on the problems that this phase of the privatization process entails, the second set of problems is how to determine the fiscal capacity of the economy to respond to all claims in full. Several major questions arise: Can the fiscal system afford the totality of the claims? Are the tax payers willing to pay taxes for an indefinite time? Why should taxpayers, especially the generation that inherited the economic system, foot the bill of compensation for expropriations they were not responsible for? Our presentation of these issues is not to discourage serious privatization efforts. To the contrary, our intention is to anticipate these problems because they are realistic and legitimate and the authorities in charge of designing and managing the privatization process must be prepared to deal with all the relevant issues, otherwise they will be flooded with problems that they will have to resolve by improvising ad hoc decisions. Yet another more serious problem can arise. Why compensate only for those losses of physical or financial property? Many others have suffered losses caused by the abuses of power during the communist stage, especially in terms of death, imprisonment or forced migration. Aren’t the victims of such losses equally entitled to just compensation? This of course adds to the fiscal burden of compensation as it might involve staggering volumes of resources that can be expected to be unaffordable in the short run and precariously affordable in the long run. On top of all this we still have to add the foreign claims that in many cases, especially for Cuba, represent a sine qua non condition to normalize the country’s international relations, where the United States plays a critical role. Even though we are not discussing this aspect of the privatization process in this paper, it is necessary to include this issue to complete the inventory of issues that Cuba will have to navigate if some day it wants to carry out a privatization process. Next we will review some salient elements of the privatization experience of Albania, Estonia and Russia. We selected these three countries because they show three almost polarly different trajectories of privatization. Albania, for instance, experienced minimum privatization, lacking in a sound strategic approach that made the claimants finally rely on ad hoc restitution of some properties. Estonia, on the other hand, presents the most thorough and systematic privatization process, close to what could be the canon of good conception and management of the problem. Russia, however, presents conditions that differ from Albania and Estonia as privatization consisted more on divesting publicly owned assets that were never private. As a result, the lack of legitimate claims deprived the country of a certain mechanism of checks and balances that would have been provided by the legitimate owners. But the fact remains that Russia represents an example of how privatization should not be conducted, because of its extreme disorganization, legal and otherwise, which resulted in heavy losses for the country’s economy, illegitimate transfer of assets and finally a high concentration of property in the hands of what has been properly called the new oligarchs. According to Cano (2009), Albania’s privatization seems to have been ill conceived from the very start. His analysis invites the reader to think that the Albanian government either lacked the political will to conduct a serious privatization policy, did not know how to do it, or all of the above. Cano’s discussion of the Albanian Property Restitution and Compensation Agency is mainly focused on the organization, legal and some operational aspects of the process in that country, but reflects a lack of conceptual thinking regarding formulation of strategies. The closest strategic element appears to have been a concern for the independence of the agency from the central government’s influence. There is no evidence that the government had clear goals or specific privatization policy objectives and probably, as a result, the agency is not reported to have achieved any privatization at all. Nevertheless, an unknown number of restitutions of formerly private properties were implemented on an ad hoc basis, apparently as a result of personal contacts and lobbying government authorities that had the power to return such assets, while there is no evidence of any significant compensation when restitution was not feasible. Albania suffers from a high level of corruption and government ineffectiveness, conditions that represented major obstacles to mount a transparent and efficient privatization policy. The World Bank (2006) reports the difficulties in the Albanian privatization efforts, though they held an optimistic view of the results of some government initiatives to strengthen the system. At this point, however, we have not found solid evidence that such efforts have been successful. The Estonian case, albeit not perfect, offers the bestcase scenario of the three selected country studies. Before World War II, a mere third of Estonians were wage earners. A significant portion of the economy was made up of privately owned, small to medium size enterprises in manufacturing and consumer goods sales (Liuhto 1996, 122 & 124). The entrepreneurial spirit managed to survive the communist period. This proved helpful in the economy’s transition particularly since the restitution, or return, of property to legitimate claimants (mostly heirs) ignited the desire to re-open family businesses. Estonia’s economic and political transition was influenced by several factors stemming from the country’s independence from the Soviet Union. Specifically, tensions between ethnic Estonians and Russians openly erupted. The Russian population was imported by the Soviet Union to head state enterprises and other government activities. They moved into dwellings confiscated from Estonians and never learned to speak Estonian. Estonians, in a natural rejection of all things Russian, sought to eliminate their former colonizers from their country’s new market economy. 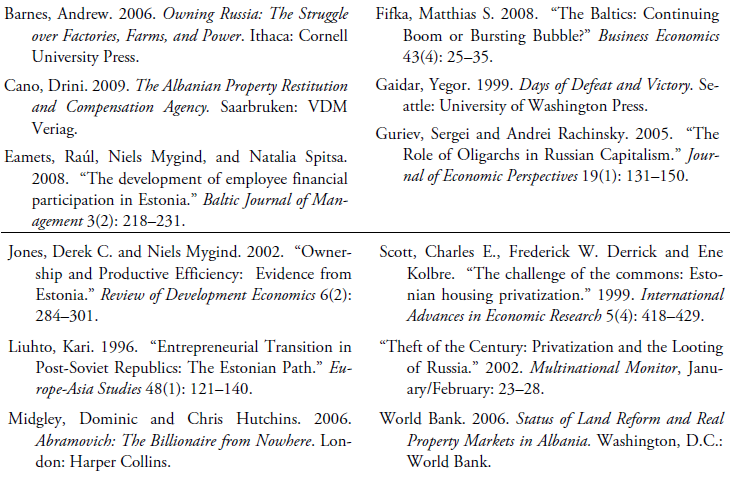 Restitution of confiscated property to Estonian claimants literally and figuratively meant that Russians descended from the elite to second-class outsiders. Furthermore, Estonians who received privatization vouchers as compensation for confiscated properties quickly participated in the new economy while only a few Russians received vouchers. The return of property to legitimate claimants was limited to structures that had not been significantly altered in half a century. Despite this seeming impossibility, a significant number of properties were restored to former owners and their heirs. Occupants of previously confiscated houses and apartments were given up to ten years to find new housing. Some occupants (usually Russians) never bothered to relocate. This remains a contentious issue. Claimants received their family’s factories, shops and other structures. Exiles returned not only to recover property, but also to participate in new business ventures and various government positions. The privatization of multi-unit housing ironically resulted in a measure of instability for new owners. In an unusual clause, apartment owners were denied access to mortgages until the land on which the structure stood was also privatized. Until then, the apartment was considered movable property. As in all other formerly communist countries, Estonia inherited a housing stock in disrepair and new owners lacked the ability and know-how to maintain and manage their properties. Newly minted owners also expressed distaste and reticence to jointly-owned common areas in buildings (Scott, Derrick and Kolbre 1999, 424–425) as this reeked of collective decision- making, a legacy they believed to have rid themselves of. Estonia’s post-independence government provided a highly favorable environment to both domestic and foreign investors who were allotted equal rights. Employees were not given preference in any privatization schemes and employee ownership virtually disappeared in the early years of the transition. Labor union membership also dropped dramatically (Eamets, Mygind and Spitsa 2008, 220). The “loose registration policies and inadequate controlling mechanisms” (Liuhto, 128) that attracted investors also resulted in rampant tax evasion. To the investors’ delight the banking sector is also fairly unregulated and foreign investors can fully repatriate their profits. Aside from tax evasion, the country has largely shed corruption (Fifka 2008, 29–30). Unsurprisingly, privatized firms have outperformed state-owned firms (Jones and Mygind 2002, 294). As pointed out earlier, privatization in Russia mainly consisted of divesting public property that was never private. Restitution of or compensation for expropriated assets was not important. At the same time, right after the disintegration of the Soviet Union the process differentiated itself significantly from the privatization policies and processes that took place in other communist countries outside the Union. As former Russian Prime Minister Yedor Gaidar put it, “Russia was facing the largest and most complex privatization process in the history of mankind” (Gaidar 1999, 76). The motivations were political as well as economic. On the political dimension there was the need to create a ratchet to make the escape from communism irreversible. On the economic front, there was the urgent need to reactivate levels of production and save the country from a major food crisis literally leading to starvation. As a result of many pressures, privatization had to be implemented on a massive scale and rapidly, a form of the strategic approach that was denominated “shock therapy,” a term that carried a great degree of conceptual simplemindedness, but was the price to be paid for an expeditious implementation of profound reform programs. As there was no time for accurate conceptualization (i.e., what should be done first, restructuring public enterprises and then divesting them, or the other way around? ), no time for planning and much less time to create the appropriate legal framework, the Russian privatization was haphazard. Many large public enterprises ended up in a few hands of well connected operators, some nimble members of the nomenklatura, and some KGB officers. Voucher fund schemes were essentially pyramid schemes where insiders bought up control of most businesses for 3 to 10 percent and average Russians lost everything (“Theft of the Century” 2002, 24 & 26). The deviation of what actually took place from what could have been a legitimate and more equitable process was significant. Examples of the anomalies in the process are offered by Midgley and Hutchins (2004) in their book Abramovich: The Billionaire from Nowhere. One of the outcomes of such disorganized privatization was that the divestiture process was closer to a looting exercise than privatization, where some individuals, more interested in a short-term gain than in long-term profitability were able to dismantle entire enterprises to sell their assets at liquidation prices and then take the proceeds out of the country. Asset stripping and fraud funded a significant volume of capital flight (“Theft of the Century” 2002, 26). The super wealthy Russian oligarchs enjoy no legitimacy among average Russians, a fact that nevertheless does not empower the common man in the country because “larger conglomerates are certainly more effective than small firms in influencing judicial and political decisions” (Guriev and Rachinsky 2005, 140– 142). While there are no reports of previously private property returned to their legitimate owners and heirs, there are still a significant number of Russian enterprises that remain public today. Properties confiscated early in the Russian revolution have not and evidently will not be returned to their heirs. The homes and lands of the former aristocracy are currently in the hands of former communists. Not only did they not have to worry about properties being returned but they also, by and large, have more financial resources to maintain the properties than the heirs of original owners. The Russian government has made repeated statements that restitution is not an option. Based on these three countries, a picture about the advantages of privatization appears to emerge as depicted in Table 1. Serious or intense and structured privatization must be accompanied by reforms that will impact the general economic climate in favorable ways. It can be said that privatization is in fact a proxy for more economic freedom that will tend to be used by their beneficiaries on their own behalf, but also benefitting others in the context of a predominantly free market economy. Under these conditions the good old “invisible hand” does work even if we know that while not perfect, it is by far much more efficient than the too visible hand of state intervention or oligarchic predominance. Yet as privatization helps spreading the advantages of private property among larger proportions of the population of any country, while helping in diminishing inequalities in the distribution of income and wealth, it also generates political externalities that enhances individual freedoms and wider participation in a democratic context. Privatization creates strong incentives for the sustainable development of the rule of law, as contractual security becomes a sine qua non condition. Privatization in Cuba is still pending. As such, it is wise in the meantime to extract lessons, good and bad, from other countries. Before reporting on the lessons learned from Albania, Estonia and Russia we will describe current conditions in Cuba for privatization. There are historical considerations to be made when the Cuban regime announces or permits a partial liberalization of the economy. Each time farmers markets and individual private industry has been permitted it has logically thrived. Average Cubans made significant amounts of money that led to considerable gains of confidence within the possibilities of a totalitarian state. Quickly the state shut them down in fear that Cubans behaved as bourgeois capitalists. This has long been deemed dangerous behavior. Any recent loosening of restrictions should be taken with a grain of salt and possibly as a public relations campaign in conjunction with its “release” of political prisoners, otherwise known as forced exile of oppositionists. Raúl Castro has publicly declared some relaxation of restrictions on small private enterprise such as permitting usufruct rights to idle lands. That is, those who work the land can technically make use of their products for personal consumption and sale. This measure does not mean that the state is no longer the owner. To date, the only people who can engage in market economy real estate transactions in Cuba are foreigners. As long as the regime maintains the power to shut down private enterprise, the possibility for a large-scale privatization scheme is limited if not altogether impossible. Private properties confiscated by the regime are still identifiable. Many lands and factories are idle and rundown. Formerly private properties in good condition are generally in the hands of regime officials and foreigners, particularly residences. Foreigners have knowingly invested in confiscated properties without regard for original owners. If there is ever a privatization scheme in Cuba that includes restitution, there will be multiple claims made on these properties. Movable properties such as artworks have been sold or are loaned to museums that ignore items registered in Art Loss Register, a database ethical institutions refer to for provenance. Other movable assets such as machinery and vehicles are more than likely dismantled or no longer functioning. According to the regime, former owners and their heirs have no rights to their confiscated properties. We present three alternative privatization strategies based on: (1) unqualified respect for old property rights regardless of consequences for growth; (2) the need to maximize economic recovery as top policy priority; and (3) political expediency and feasibility: an eclectic approach. We recommend alternative (3), whereby legal, political and social expediency are ensured. In order to establish a valid private property rights structure in Cuba there must be respect for former owners and their heirs. If privatization takes place based on the sale of stolen properties a weak and corrupt “private” property foundation will be codified. Yet, claimants will have to present necessary documentation within established deadlines. Otherwise, the delays caused by lingering and litigious restitution claims will create delays in making properties economically viable. If privatization were feasible in Cuba today all previously confiscated assets would be restored to former owners and their heirs as soon as possible in order to make them productive at least in the short run. Residences would take on a more gradual approach as landlord-tenant relations are established and rents determined. Residences occupied by regime members and collaborators represent a separate category, as secret agents will need to be discovered via the opening of state security files. These occupants should at a minimum not be rewarded with the ownership or continued use of a confiscated property especially in the scenario where there is limited judicial capability to prosecute. The funding of compensation payments for properties that cannot be returned ought not to be tax based, as this is unfair to many people who had nothing to do with confiscations and would mortgage Cuba for several generations. Compensation payments may be funded with negotiable tax credits. There also exists the possibility of offering comparable or comparable value properties in lieu of original properties in cases where original properties cannot be returned. Privatization of state-owned enterprises created after the revolution may generate funds to help pay for compensation. The value of these sales is as yet unknown therefore the amount made in privatization receipts cannot be estimated. The legal and strictly voluntary repurchase of real estate properties should be facilitated as there are claimants who may prefer to bypass all bureaucratic hurdles in a claims process. These proposed measures might prevent Cuba from falling into the Russian trap of allowing the elite to virtually purchase the island and leave out former owners and others from market entry. Nevertheless, it must be noted that the fall of a government does not imply a change in the totalitarian methods of its participants. Cuba’s rapid response brigades, undemocratic police force, and state security agents are unlikely to suddenly mend their ways. The old guard may use them to manipulate any privatization methods in their favor. An obsession with creating government agencies to handle privatization will hinder development as in Albania. The creation of state agencies leads to a bloated public sector as mentioned at the beginning of this paper. The bloated public sector would foster the potential for corruption in privatization in the form of bribes, forged documents, and illegitimate claims. A favorable environment to domestic and foreign investment as in Estonia must be established carefully. Cubans already have a negative impression of foreigners as a privileged class. Some measures must be taken so that domestic enterprises also have the potential to thrive. Allowing exiles to recover property as in Estonia will invite their active participation in reforms, if not a wholesale move back to Cuba. This will be a much needed injection of capital and know-how that will directly benefit average Cubans through loans and employment no longer controlled by the state. The return of property to Cubans on the island will allow them access to loans and may encourage them to stay in Cuba as opposed to migrating elsewhere. The best scenario for Cuba is one where Cubans who have been denied benefits enjoyed by the regime, its collaborators and foreigners have the opportunity to flex their entrepreneurial muscle and help develop their country into one where the rule of law is respected and socioeconomic options abound. Tania C. Mastrapa is the founder of Mastrapa Consultants, a Miami-based firm that specializes in future claims on property confiscated in Cuba and Venezuela. Her upcoming publications include the “Cuba” and “Cuba Archive” entries in the Encyclopedia of Transitional Justice (Cambridge University Press, 2011), Cuba under Construction, Botin Cubano, and Confiscated Fate (Blaker Books, 2011). She is a board member of the Development Research Center as well as a member of the Association for the Advancement of Baltic Studies, Association for Slavic, East European and Eurasian Studies, Southern Conference on Slavic Studies and the Association for Women in Slavic Studies.